largest 12v battery in 2013 leaf? 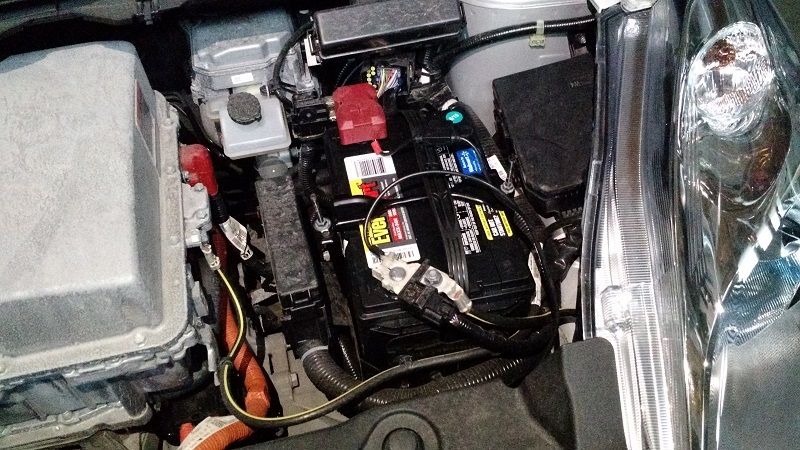 Re: largest 12v battery in 2013 leaf? I had a similar problem with my 12v dying constantly. Then all of a sudden, it just stopped reoccurring. Now I check the charge occasionally with one of these tools. When I'm out of town, I'll put it on a tender as well. By the way, Costco has a 3 amp battery tender for $40. After a while with the new larger battery in there I have noticed some interesting things. When the car is bulk charging the 12v aux battery it sits a the top end voltage a LOT longer. I have also noticed in the last two weeks when I went to charge the battery with an external charger it was topped of in 15 minutes or so suggesting it was adequately charged, with the original battery it often took 5 to 10 hours. Now I know it has only been two weeks, time will tell. Having worked with large lead acid banks in solar PV, my guess is the original battery was to small for the charging algorithm. So when the system was at the "bulk" phase and it saw the charging amperage drop off (don't know the threshold) the car would go in to "float". Now with a larger battery it takes more amperage to hit that same point and in turn puts more power back in the battery. My guess this is like having to large of a charger on to small of a battery. To add to this as the battery ages it's capacity would fall off and cause the situation to get even worse, a cascading effect. BrockWI wrote: After a while with the new larger battery in there I have noticed some interesting things. When the car is bulk charging the 12v aux battery it sits a the top end voltage a LOT longer. I noticed the same thing when I replaced the original battery in my 2011 with an Optima AGM deep cycle (Yellow Top) of the original size. That Optima was still performing like new when the car met its demise 13 months after installing it. Unfortunately, the insurance company's storage yard would not let me keep the battery when I went to look at the car and make sure I got everything out of it. The original Nissan flooded cell batteries have relatively high internal resistance when new and get higher as they age. This makes the DC-DC converter drop back to float sooner than it should. The lower internal resistance of the AGM battery allows it to charge to a higher SOC before the DC-DC converter drops back to float. As soon as the Nissan flooded cell battery in the 2015 starts getting weak, I will replace it with an AGM even if it is still under warranty. As you are seeing, there is no problem with the charging algorithm of the DC-DC converter when it is charging a battery with low internal resistance. Well 2 months later and still in great shape, no 12v issues. I still charge the 12v once a week and every time the charger goes in to float within a few minutes. Again I truly believe the larger capacity / better battery the Leaf's 12v charging works fine. The bottom line is some of the existing or "stock" group 24 batteries are undersized for the car and I would recommend a new group 24 or larger 34N replacement. I am sure Lithium would work as well, but I was concerned that the car might not play well with it. Also if I return the car when the lease is up I could swap back the stock battery or just leave this one in there and I doubt anyone would be the wiser. BrockWI wrote: Here is a pic of the battery in there. I should have taken a before and after, but here it is. Thread resurrection. I was just thinking about your battery and the barely reaching negative cable. Maybe if you got a 34R battery, things would be better? Not that I'm saying this is a recommended battery, but here's a 34R battery I found: https://www.napaonline.com/en/p/NBP8434R. Notice which side of the casing the terminals are? And, compare to where they are from my '13 w/the battery my Nissan installed (as a free warranty replacement) at viewtopic.php?p=439322#p439322.